Taipei, Taiwan, September 10th 2013 – ASUSTOR Inc. , a leading innovator and provider of network storage solutions, has announced today the launch of a new live demo site for users to test ASUSTOR Data Master (ADM) 2.0, the latest version of ASUSTOR’s in-house developed NAS operating system. The ADM 2.0 live demo will allow users to experience ASUSTOR’s intuitive software first hand before making any purchasing decisions. ADM 2.0 features an array of new and innovative features along with all-new mobile apps, AiMaster and AiData, which will allow users to truly experience the convenience of cloud computing while on the go. ADM 2.0 is the latest installment of ASUSTOR’s widely praised NAS operating system. It features a substantially optimized user interface that is both intuitive and user friendly. Newly added features allow users to freely upload their own desktop wallpaper, choose between 16 different languages, pin frequently used Apps to the ADM menu bar and organize the order of their Apps, giving each user the ability to create their own customized desktop. Many new and original functions have also been added including the industry's first Searchlight search engine which supports fuzzy searches and helps users find required files, folders and applications. Additional new features include SoundsGood Web music player, FTP Explorer, the first FTP client designed for NAS use that offers an intuitive user experience similar to most file managers, Mission Mode backup which helps to ensure the completion of backup jobs, and a VPN client. ADM 2.0 also features App Central, an App platform that contains the highest number of add-on Apps in the industry (over 100). App Central allows users to download NAS Apps to add functionality and explore the unlimited potential of NAS. All of the functions in ADM are represented using simple icons which help guide the user to complete any configurations they need in just a few easy steps. ADM 2.0 comes with all ASUSTOR NAS products providing a perfect integration of hardware and software that allows users to easily create their own personal cloud storage platform. 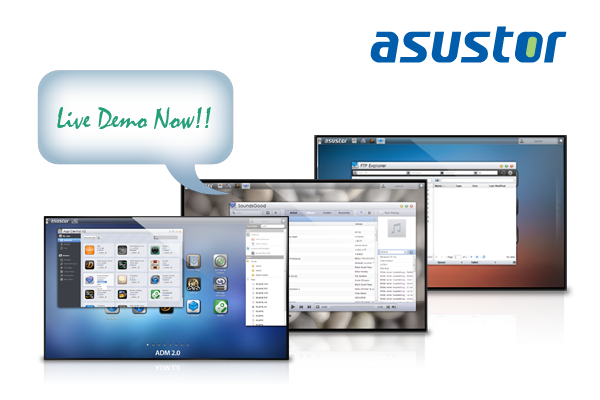 In addition to trying out the ADM 2.0 live demo from their Web browsers, users can also install ASUSTOR's exclusive AiMaster and AiData mobile apps to try. Users need only install these apps and then login using the Cloud ID from the demo site to begin experiencing the convenience of cloud computing while on the go.